Indian Ornamental Tarantulas are one of the most beautiful, fascinating tarantulas in the hobby! The Indian Ornamental Tree Spider Poecilotheria regalis is a beautiful creature. It is one of the most favored tree spiders, and is one of the staples of the tarantula hobby. The beauty of its striking markings of black, white, and silver, make it one of the most popular species being kept both by beginners and advanced hobbyists. Indian Ornamental Tarantulas are a somewhat elongated species, with the males being even more slender than the females. They are hardy, and relatively fast growing. Adult females can have a leg span reaching up to 9 inches (22cm), with males averaging about 7inches (18 cm). Females can live up to 8 years. As with all tarantulas, males have a much shorter lifespan, living only a third as long as females. These beautiful Ornamental Tree Spiders are gray overall, but with a wonderful complex pattern of whites and blacks in stripes and chevrons. Adorn in this glorious and commanding ornamentation, they are also known as the Regal Parachute Spider and the King Parachute Spider.There are bright yellow spots under the first pairs of legs, on both males and females, that flash when this spider raises its legs in a defense posture. This popular Ornamental Tree Spider should be considered a species that is a display animal. This species is very defensive, and therefore aggressive. It should be housed individually and should not be handled under any circumstances. Theses spiders are very quick and will bite when cornered. A bite can be medically significant for some people. Habitat: Distribution/BackgroundThe Indian Ornamental Tree Spider Poecilotheria regalis was described by Pocock in 1899. They originate from India, from Dahanee in the north (Western Ghats) and Cochin in the south. Common names it is known by are Indian Ornamental Tree Spider, Indian Ornamental Tarantula, Ornamental Tree Spider, Indian Ornamental, King Parachute Spider, and Regal Parachute Spider. 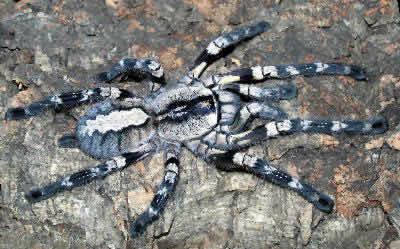 StatusThe Poecilotheria regalis are on the IUCN Red List for Endangered Species as Least Concern (LC). Although there have been threats to its habitat, it is very widely distributed. Description The Ornamental Tree Spider are a somewhat elongated species. Males average about a 7" (18 cm) leg span with females reaching up to 9" (22cm). They are gray overall with a wonderful, complex pattern of white and black stripes and chevrons. Both males and females boast a warning coloration of bright yellow spots under the first pairs of legs. These spots are flashed when the spider raises its legs in a defense posture. Food and FeedingThough Poecilotheria species seem to prefer flying insects such as moths, they will feed eagerly on crickets, grasshoppers, and large specimens will even feed on an occasional small mouse. HousingThe Indian Ornamental Tree Spider is an arboreal species. It should be kept in a large, vertically oriented enclosure. A modified aquarium with part screened sides and screened top works best. If the enclosure becomes too dry, the spiders will not do well. One way to overcome the dilemma of the strange combination of needs - high humidity and high ventilation - is to use a deep (4 to 5") substrate of damp sand and peat moss and provide several live plants within the enclosure. These plants can be placed within the enclosure still in their pots or can be planted in the deep substrate. These live plants will not only provide excellent places for the spiders to establish homes, they will provide areas for breeding and egg-laying. Add one or two shallow water dishes and mist the entire enclosure once a day to every other day, depending on the conditions of the room in which the enclosure is located. The cage should be allowed to dry out in between mistings. Cage CareA good habit to get into is cleaning up any uneaten prey items the day after feeding your blue tarantula as decaying organic matter commonly attracts mites, fungus, mold and other potentially harmful organisms into the enclosure. If your pet has recently molted, remove uneaten prey items immediately. Newly molted tarantulas are vulnerable until their exoskeletons hardens. BehaviorThese tree spiders are best housed individually. Though siblings may be okay together before their first molt, they will not be social as adults. Handling This species is very aggressive / defensive and should not be handled under any circumstances. The bite can be medically significant for some people. We suggest using a paint brush or other tool to corral the Ornamental Tree Spider and to move it from enclosure to enclosure for cleaning, maintenance, or for breeding attempts. Reproduction The Indian Ornamental Tarantula has proven somewhat easy to breed. Mature males are slender and long-legged compared to females. Males have no tibial hooks for mating. Adult males should be carefully introduced into the female's enclosure after he has produced a sperm web. The female should be very well-fed before any introductions as Poecilotheria females are notorious for attacking and eating males before any mating can occur. If both male and female are well-fed, success is more likely. The male can be protected with a piece of cardboard or other tool if he is to be used for further breeding attempts. Once mating occurs, the female should be fed in anticipation of an egg sac. The egg sacs of Ornamental Tree Spiders have tended to be small, in the 40 to 50 range. Spiderlings are hardy and grow quickly when set up properly and can even be raised communally if kept well-fed. Be sure to offer them a large enclosure with multiple retreats and hiding spots. Availability Captive-hatched spiderlings are available in large numbers to hobbyists. the indian ornimental spider should not eat the crickets with there shells on ! why not? I have had mine 3 years and she has had no problem with the shells. venom and he almost died! so i held a chilean rose-haired tarantula and it never tried to bite me, it rocks. so i suggest the chilean rose-haired tarantula but what ever you do, never...EVER...EVER get an ornamental tree spider. These spiders are sweet hearts. They are just shy. There have been no deaths from tarantula bites. The chances of being bit by a tarantula are very rare. The chances of severe side effects from a bite of this genus are significantly low against the number of bites. Moreover, tarantulas will warn you several times before they actually bite. Never pick up a tarantula unecessarily. Owned spiders for years. Never needed to pick one up. They aren't cuddly pets. Now a very beautiful tarantula has been killed unecessarily because people can't resist picking up a tarantula. Before you ever purchase any pet (whether it's a tarantula, dog, cat or anything else) DO YOUR RESEARCH! Indian orantmentals are well known for biting. Several Old World tarantulas are biters as they don't flick hairs as a form of defense. never ever had a problem with mine and its been 3 years. This is why we need to do research and actually know how to care for tarantulas before getting into old worlds. Old worlds are not meant to be handled. As a matter of fact I handle none of them. That post is 8 years old but there are still people out there who have no experience with tarantulas and they try to handle OW. Major lack of common since. This is why you do not handle a p.regalis, they are known for biting and being venomous, of course a Chilean rose will not bite unless you agitate it but as a guy above said it is not necessary to hold tarantulas and they don't like it or get anything out of being handled. I would advise only experienced spider owners get true spiders, I have one and have experience and even get nervous trying to get her into another tank to clean her tank. These kinds of spiders are not ones you want to mess with and most likely won't give as much warning before they bite as a new world spider would. do your research, idiot. never hold a Poecilotheria. I have a mature female Indian Ornamental who was given to me and shes a lot more..tarantula than I think I can handle. I'm looking into selling her to someone who's experienced with her breed. Also how much is she worth? I have many exotic pets. They enjoy our interactions during feedings. I give them all large cages with live plants and the best possible environment. The less I handle them the happier and more comfortable they become. Why does every pet have to be scratched behind the ear or be taught to say 'polly wants a cracker'. Don't say it's for anybody's safety.